This article is about US motor manufacturing company. For the original World War II Jeep, see Willys MB. When it became obvious that the United States was eventually going to become involved in the war raging in Europe, the U.S. Army contacted 135 companies asking for working prototypes of a four-wheel-drive reconnaissance car. Only two companies responded to the request: American Bantam Car Company and Willys-Overland. The Army had set what seemed like an impossible deadline of 49 days to supply a working prototype. Willys asked for more time, but was refused. The bankrupt American Bantam Car Company had no engineering staff left on the payroll and solicited Karl Probst, a talented freelance designer from Detroit. After turning down Bantam's initial request, Probst responded to an Army request and commenced work, initially without salary, on July 17, 1940. Probst laid out full plans for the Bantam prototype, known as the BRC or Bantam Reconnaissance Car, in just two days, working up a cost estimate the next. Bantam's bid was submitted, complete with blueprints, on July 22. While much of the vehicle could be assembled from off-the-shelf automotive parts, custom four-wheel drivetrain components were to be supplied by Spicer. The hand-built prototype was completed in Butler, Pennsylvania, and driven to Camp Holabird, Maryland, for Army testing September 21. The vehicle met all the Army's criteria except engine torque. The Army felt that the Bantam company was too small to supply the number of vehicles it needed, so it supplied the Bantam design to Willys and Ford, who were encouraged to make their own changes and modifications. The resulting Ford "Pygmy" and Willys "Quad" prototypes looked very similar to the Bantam BRC prototype, and Spicer supplied very similar four-wheel drivetrain components to all three manufacturers. Fifteen hundred of each of the three models (Bantam BRC-40, Ford GP, and Willys MA) were built and extensively field-tested. Delmar "Barney" Roos, Willys-Overland's chief engineer, made design changes to meet a revised weight specification (a maximum of 1,275 lb (578 kg), including oil and water). He was thus able to use the powerful but comparatively heavy Willys "Go Devil" engine, and win the initial production contract. 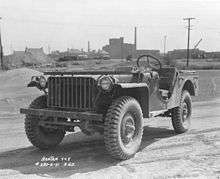 The Willys version of the car would become the standardized Jeep design, designated the model MB and was built at their plant in Toledo, Ohio. The familiar pressed-metal Jeep grille was actually a Ford design feature and incorporated in the final design by the Army. Since the War Department required a large number of vehicles to be manufactured in a relatively short time, Willys-Overland granted the United States Government a non-exclusive license to allow another company to manufacture vehicles using Willys' specifications. 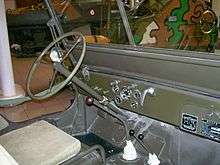 The Army chose Ford as the second supplier, building Jeeps to the Willys' design. Willys supplied Ford with a complete set of plans and specifications. 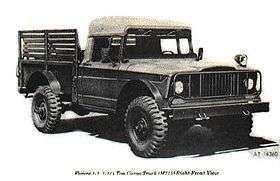 American Bantam, the creators of the first Jeep, built approximately 2700 of them to the BRC-40 design, but then spent the rest of the war building heavy-duty trailers for the Army. The Jeep has been widely imitated around the world, including in France by Delahaye and by Hotchkiss et Cie (after 1954, Hotchkiss manufactured Jeeps under license from Willys), and in Japan by Mitsubishi Motors and Toyota. The utilitarian good looks of the original Jeep have been hailed by industrial designers and museum curators alike. The Museum of Modern Art described the Jeep as a masterpiece of functionalist design, and has periodically exhibited the Jeep as part of its collection. Ernie Pyle called the Jeep, along with the Coleman G.I. Pocket Stove, "the two most important pieces of noncombat equipment ever developed." Jeeps became even more famous following the war, as they became available on the surplus market. Some ads claimed to offer "Jeeps still in the factory crate." This legend persisted for decades, despite the fact that Jeeps were never shipped from the factory in crates (although Ford did "knock down" Jeeps for easier shipping, which may have perpetuated the myth). The Jeepney is a unique type of taxi or bus created in the Philippines. 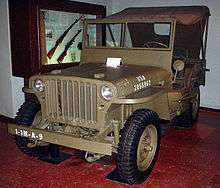 The first Jeepneys were military-surplus MBs and GPWs, left behind in the war-ravaged country following World War II and Filipino independence. Jeepneys were built from Jeeps by lengthening and widening the rear "tub" of the vehicle, allowing them to carry more passengers. Over the years, Jeepneys have become the most ubiquitous symbol of the modern Philippines, even as they have been decorated in more elaborate and flamboyant styles by their owners. Most Jeepneys today are scratch-built by local manufacturers, using different powertrains. Some are even constructed from stainless steel. 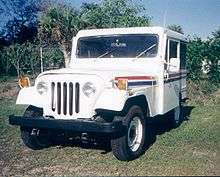 The CJ ("Civilian Jeep") series began in 1945 with the CJ-2A, followed by the CJ-3B in 1953. These early Jeeps are commonly referred to as "flatfenders" because their front fenders were flat across the front, the same as their military precedents, the Willys MB and identical Ford GPW models. The CJ-4 exists only as a 1951 prototype, and is the "missing" link between the flat-fendered CJ-2A and CJ-3B and the round-fendered CJ-5 first introduced in 1955. 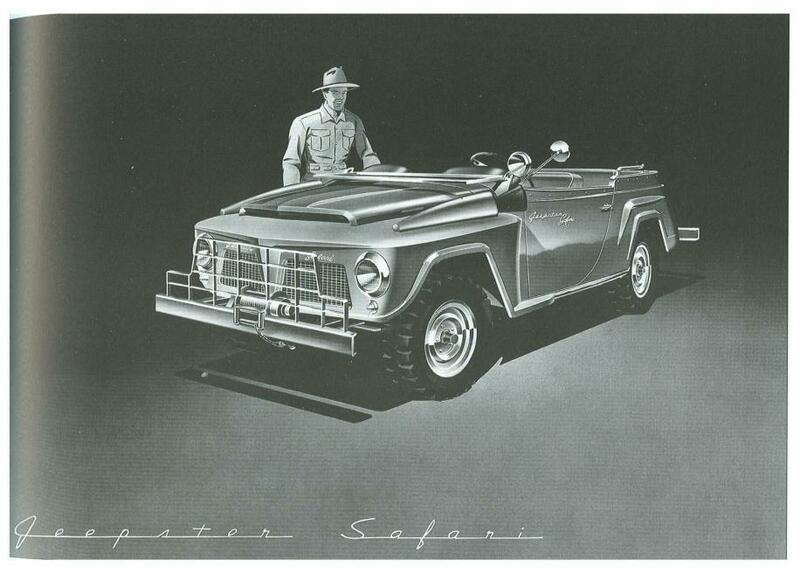 Jeep advertising has always emphasized the vehicle's off-road capabilities. Today, the Wrangler is one of the few remaining four-wheel-drive vehicles with solid front and rear axles. These axles are known for their durability, strength, and articulation. New Wranglers come with a Dana 44 rear differential and a Dana 30 front differential. The upgraded Rubicon model of the JK Wrangler is equipped with electronically activated locking differentials, Dana 44 axles front and rear with 4.10 gears, a 4:1 transfer case, electronic sway bar disconnect and heavy duty suspension. 1 2 Auto Editors of Consumer Guide (14 December 2007). 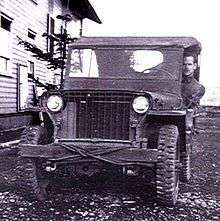 "1940–1941 Jeep". Retrieved 24 February 2012. ↑ Stewart, Doug (1992). "Hail to the jeep! Could we have won without it?". Smithsonian. 23 (8): 60–69. ↑ Swan, Tony (January 1991). "Jeep Thrills". Popular Mechanics. 168 (1): 106–107. ↑ "The Military Jeep". Cossor.com.au. Retrieved 2010-03-12. ↑ "Invention of the Jeep - Pennsylvania Historical Markers". Waymarking.com. 2006-03-09. Retrieved 23 February 2012. ↑ "Ford Manufacturers a Jeep". Jeep History. Retrieved 4 July 2012. ↑ Notman, Robert (2006). Bantam, Ford and Willys-1/4-Ton Reconnaissance Cars. Lulu.com. p. 68. ISBN 978-1-84728-188-3. Retrieved 2010-11-30. 1 2 Brown, Arch (2001). Jeep: The Unstoppable Legend. Publications International. p. 42. ISBN 0-7853-5562-6. ↑ "Wordorigins.org". Wordorigins.org. Retrieved 2010-07-04. ↑ Borth, Christy. Masters of Mass Production, pp. 208-236, Bobbs-Merrill Co., Indianapolis, IN, 1945. 1 2 Statham, Steve (2002). Jeep Color History. MBI Publishing. pp. 26–27. ISBN 978-0-7603-0636-9. Retrieved 28 October 2010. ↑ Morr, Tom; Brubaker, Ken (2007). The Joy of Jeep. MBI Publishing. p. 50. ISBN 978-0-7603-3061-6. Retrieved 28 October 2010. ↑ Zaloga, Steven J. (2005). Jeeps 1941–45. Osprey Publishing. p. 10. ISBN 978-1-84176-888-5. ↑ "The History of Jeep". Gear Heads. 17 May 2012. Retrieved 3 July 2012. ↑ Borth, Christy. Masters of Mass Production, pp. 208-36, Bobbs-Merrill Co., Indianapolis, IN, 1945. ↑ Herman, Arthur. Freedom's Forge: How American Business Produced Victory in World War II, pp. 214, 218, 342, Random House, New York, NY, 2012. ISBN 978-1-4000-6964-4. ↑ "New Acquisitions—Smart Car, Volkswagen "Beetle," and Willys-Overland Jeep—Join Three Other Automobiles in MoMA's Collection" (PDF). The Museum of Modern Art. June 2002. Retrieved 2010-11-30. ↑ "Jeep in a crate $50! - The legend of Jeep Body Tubs". motorcitymusclecars. 7 July 2010. Retrieved 18 January 2015. ↑ "The 3A's Navy Cousin - The CJ-V35/U". Cj3apage.com. 1950-02-01. Retrieved 2012-01-14. ↑ "Mitsubishi Jeep Photos on The CJ3B Page". Film.queensu.ca. 2002-08-29. Retrieved 2009-09-23. ↑ Dunne, Timothy (2007-11-02). "Can Chrysler Rebound in China?". Business Week. Retrieved 2010-10-26. ↑ "Toledo-built Jeeps' sales results abroad mirror those in North American market". News.top100.biz. 2007-11-13. Retrieved 2010-07-04. ↑ "Jeepster VJ". Jeep.off-road.com. Archived from the original on 17 October 2007. Retrieved 23 February 2012. ↑ "Jeepster yellow front". americanjeepsterclub.org. Archived from the original on 24 February 2013. Retrieved 2014-01-23. ↑ "Jeepster yellow rear". americanjeepsterclub.org. Archived from the original on 24 February 2013. Retrieved 2014-01-23. ↑ "Jeepster red front". americanjeepsterclub.org. Archived from the original on 24 February 2013. Retrieved 2014-01-23. 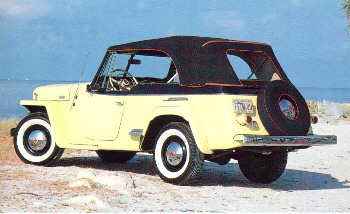 ↑ "Jeepster fixed roof coupe". americanjeepsterclub.org. Archived from the original on 24 February 2013. Retrieved 2014-01-23. 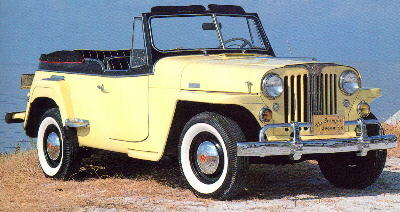 ↑ "196X Jeepster front". americanjeepsterclub.org. Archived from the original on 24 February 2013. Retrieved 2014-01-23. 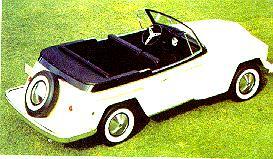 ↑ "196X Jeepster top view". americanjeepsterclub.org. Archived from the original on 24 February 2013. Retrieved 2014-01-23. ↑ "Jeepster Safari". americanjeepsterclub.org. Archived from the original on 24 February 2013. Retrieved 2014-01-23. ↑ Cranswick, Marc (2001). Cars of American Motors: An Illustrated History. McFarland. pp. 146–147. ISBN 978-0-7864-4672-8. Retrieved 11 June 2012. ↑ Statham, Steve (2002). Jeep Color History. MBI Publishing. p. 101. ISBN 978-0-7603-0636-9. Retrieved 11 June 2011. ↑ Jewett, Dale. "2005 Detroit: Jeep blows into auto show with twin-Hemi Hurricane". Retrieved 23 February 2012. ↑ "Jeeps Around the World on The CJ3B Page". Film.queensu.ca. 2009-01-31. Retrieved 2010-07-04. ↑ "Jeeps in Argentina on The CJ3B Page". Film.queensu.ca. 2005-02-06. Retrieved 2010-07-04. ↑ "Jeeps in Australia on The CJ3B Page". Film.queensu.ca. Retrieved 2010-07-04. ↑ "Jeeps in Brasil on The CJ3B Page". Film.queensu.ca. Retrieved 2010-07-04. ↑ "Kaiser Jeep in Canada 1959–69 on The CJ3B Page". Film.queensu.ca. Retrieved 2010-07-04. ↑ "Fiat to Re-introduce Jeep to China". ChinaAutoWeb.com. May 2010. ↑ "Jeeps in Colombia on The CJ3B Page". Film.queensu.ca. 2010-03-22. Retrieved 2010-07-04. ↑ "Jeeps in France on The CJ3B Page". Film.queensu.ca. 2008-09-17. Retrieved 2010-07-04. 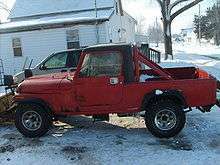 ↑ "Mahindra Jeeps on The CJ3B Page". Film.queensu.ca. 2007-01-31. Retrieved 2010-07-04. ↑ "Jeeps in Italy on The CJ3B Page". Film.queensu.ca. 2009-03-24. Retrieved 2010-07-04. ↑ "Jeeps in Japan on The CJ3B Page". Film.queensu.ca. 2009-01-31. Retrieved 2010-07-04. 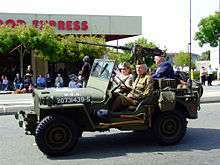 ↑ "Jeeps in Korea on The CJ3B Page". Film.queensu.ca. 2006-11-02. Retrieved 2010-07-04. ↑ "Jeeps in Mexico on The CJ3B Page". Film.queensu.ca. 2002-07-25. Retrieved 2010-07-04. 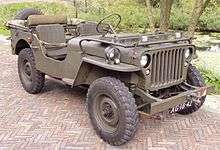 ↑ "Jeeps in the Netherlands on The CJ3B Page". Film.queensu.ca. Retrieved 2010-07-04. ↑ "Jeepneys of the Philippines on The CJ3B Page". Film.queensu.ca. 2005-04-27. Retrieved 2012-06-11. ↑ "Philippine firm brings old WWII jeeps back to life". Afp.google.com. 2008-06-30. Retrieved 2012-06-11. ↑ "Electric minibuses start commercial operations in Philippines". Gulf-Times.com. 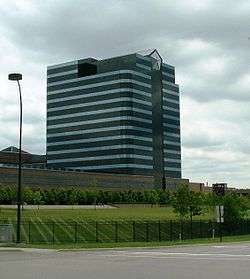 2008-07-02. Retrieved 2012-07-02. ↑ Fabella, Ferdinand (2008-06-30). "Enforcers to drive E-jeeps". ManilaStandardToday.com. Archived from the original on 8 December 2008. Retrieved 18 January 2015. ↑ "Jeeps in Spain on The CJ3B Page". Film.queensu.ca. 2009-02-12. Retrieved 2010-07-04. ↑ "Jeeps in Turkey on The CJ3B Page". Film.queensu.ca. 2005-11-22. Retrieved 2010-07-04. ↑ Frost, Laurence (27 April 2012). "China auto market laggards chase premium profile". Chicago Tribune. Reuters. Retrieved 11 June 2012. ↑ Higgins, Tim (21 May 2012). "Jeeps Sell for $189,750 as China Demand Offsets Tariffs". Bloomberg Business Week. Retrieved 11 June 2012. ↑ "Juventus nets Jeep Deal". Football-Italia.net. 2002-08-29. Retrieved 2009-09-23.